The Panache Cosmetic kit includes a dual comb brow brush for brow shaping and daily grooming and a Velvet soft applicator that applies eye makeup evenly and easily, without streaks or creases. Round and rectangular shaped soft sponges are designed to reach challenging areas of the face to evenly distribute powders, liquid and creams. Includes sponges, dual comb brow brush and an eye makeup applicator. Perfect for daily grooming purpose. Sponge comes in two shapes-round and rectangular and are ultra-soft. Great for evenly distributing makeup. Additional Information :Panache is a premium beauty brand that exudes feminism and sophistication. It specializes in head-to-toe beauty products. 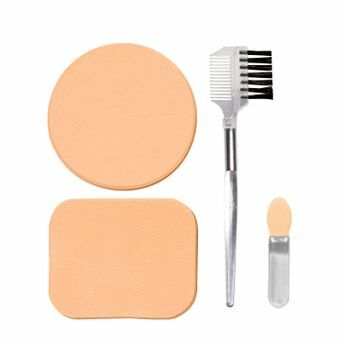 Panache Cosmetic kit is a one-stop solution for all your beauty needs! Explore the entire range of Brush Sets available on Nykaa. Shop more Panache products here.You can browse through the complete world of Panache Brush Sets .